About a month ago I tweeted that we CETIS and CAPLE had a visiting scholar working with us for this semester. I’d like to take this opportunity to more comprehensively introduce Gema, some of the work she’s doing while she’s with us, and plug our survey investigate the role of academic libraries in OER efforts (you’ll remember I ran a study in this area last year). Gema Bueno de la Fuente is a visiting scholar from the Library and Information Science Department, University Carlos III of Madrid, Spain where she works as an assistant professor teaching in several Undergraduate and Graduate Programs, e.g. the Master in e-Learning Production and Management. She holds a PhD. in Library Science since 2010 with the dissertation “An Institutional Repository of Educational Content (IREC) Model: management of digital teaching and learning resources in the university library”. Her main research interests are digital teaching and learning materials, open content, digital repositories and e-learning systems, with and special focus on the library role in these topics, mainly related to metadata, vocabularies and some specific standards. “The Centre for Academic Practice & Learning Enhancement (CAPLE) and Centre for Educational Technology and Interoperability Standards (CETIS) at the University of Strathclyde are conducting a study about the involvement of the Library as an organizational unit, and of individual librarians and other information science specialists, in OER initiatives. OER (Open Educational Resources) are “digitised materials offered freely and openly for educators, students and self-learners to use and reuse for teaching, learning and research” (OECD, 2007). This survey (http://www.surveygizmo.com/s3/669964/OER-Libraries-and-librarians) is open to any institution or initiative dealing with OER and/or open content for learning and teaching in a Higher Education context. This includes the creation and release of OER, its dissemination and promotion, the implementation of learning repositories or others management and publishing systems, the aggregation of open educational content, etc. Those projects focused solely on open educational practice are out the intended scope of this survey. The survey should be answered by an individual OER initiative team member with an overview of current activity and the team composition and profiles. The survey instrument has 15 questions and the estimated time for completion is 15-20 minutes. No personal data will be required, but you will be able to provide some basic information about your type of organization and OER initiative purpose and objectives if you wish. Participating organisations will be listed in the study report but responses are not connected to individual participants. The results will be published in a report through JISC CETIS Open Educational Resources web page. If you want to receive a free PDF copy of the final report, please provide your email address at the end of the survey (your email will not be published or held beyond distribution of the survey results). The survey is open for your feedback until Friday, November 4, 2011. Thank you in advance for participating in this study, your contribution is very valuable to us. Please feel free to forward this survey to any interesting parties or lists. Gema Bueno de la Fuente (Visiting Scholar from University Carlos III, Spain) (gema.bueno@strath.ac.uk), R. John Robertson (robert.robertson@strath.ac.uk) and Stuart Boon (stuart.boon@strath.ac.uk). if you have rubrics and marks as semantic data can you analyse for ‘soft skills’ across a programme of study? I’ll need to go back through the programme and remind myself of some of the sessions but as a first pass of some of the stuff that caught my attention emerging from opened10. not yet adequately linked or marked up and doubtless will grow a bit over time as different parts of my brain kick in. All the conference papers are available in the UOC repository . with apologies to those i know or have heard recently (Brian Lamb, Scott Leslie, Suzanne Hardy, Jane Williams, Simon Thomson, Jakki Sheridan-Ross, all the wonderful folk from the Open University, and my colleague Li Yuan) – i’m too familiar with your work for it to make this first pass but i do think it’s great! 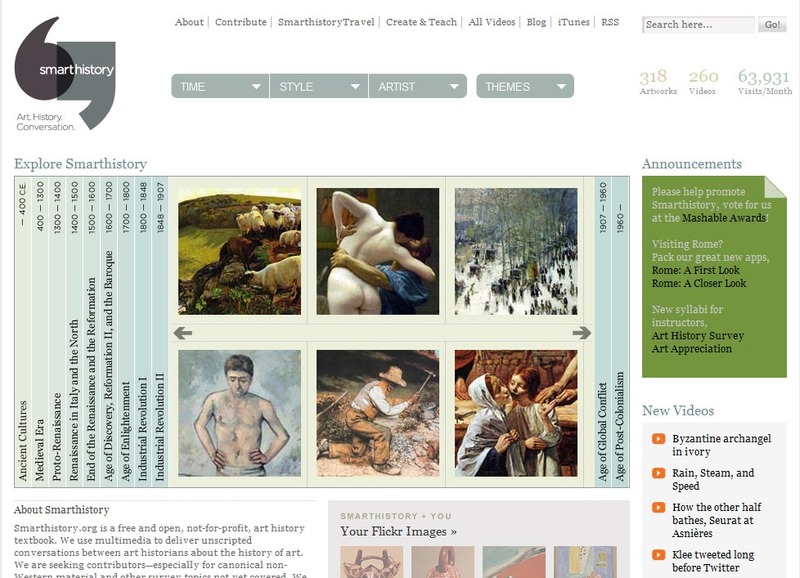 fantastic opened site for art history – working towards being a viable alternative to OER – two art history teachers making stuff as they go to help students offset the massive cost of introductory art history textbooks for foundation courses. 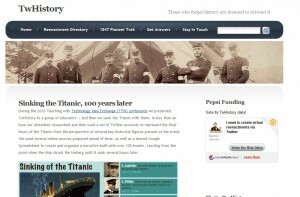 historical recreations on twitter: Gettysburg, 1847 pioneer trek, the sinking of the Titanic, the American revolution, possibly about to start working with UK national archives to cabinet war room twitter account of world war 2. Tom Caswell’s presentation. a feedreader for running open courses – a tutor sets up a blog-based course and edufeedr aggregates content from across blogging platforms designed to gather together student feedback based from wherever they blog it. OER use and attitudes surveys Joseph Hardin Mujo Research present survey results from instructors at University of Michigan and University of Valencia – surveying their willingness to use and to publish OER. Rory McGreal – examining differences Open Access makes for a university press comparing Amazon rank of Abathasca University’s press which is OA with three other Canadian university presses. results didn’t indicate any significant difference for bought physical copies but only one metric and doesn’t account for greater access provided by OA downloads. David Wiley offered some figures around Brigham Young University Independent Study Unit looking at sustainabilty of making content open – if content made open – can costs be covered by sustained or increased enrollment. the short answer- yes -just. Open Rubrics and the semantic web – Megan Kohler (Penn State) and Brian Panulla – well i’d call them feedback or assessment criteria but wither way they’ve developed an OWL ontology and reference implementations for sharing and storing marking rubrics (and associated marks) – in terms of technical developments i think this is potentially the most important thing from the conference. building courses with OER: Griff Richards presented about a project he’d worked on create course syllabi for a master’s course in instructional design. one to follow up after the final report and syllabi are out. [personally it brings me back to thinking about course syllabi around OER for librarians – but that’s another post in a month or so]. His metaphor of clothes shopping for looking for learning materials is also worth keeping around (Tailored: expensive, perfect , emperor’s new clothes; Off the Shelf: not quite fit, but do the job, reasonable price; Charity Shop: nearly free, hard to find what you want, might just find something perfect). David Wiley: Why do we need 'open'? Dublin City University – took the OER as marketing angle and did some extensive work on how to best brand OERs using product placement and advertising methodology – this presentation made me profoundly uncomfortable but it is the logical extension of some of the advice and case for OER that many of us (including me) have made. i’m going to have to read their paper and think about this. 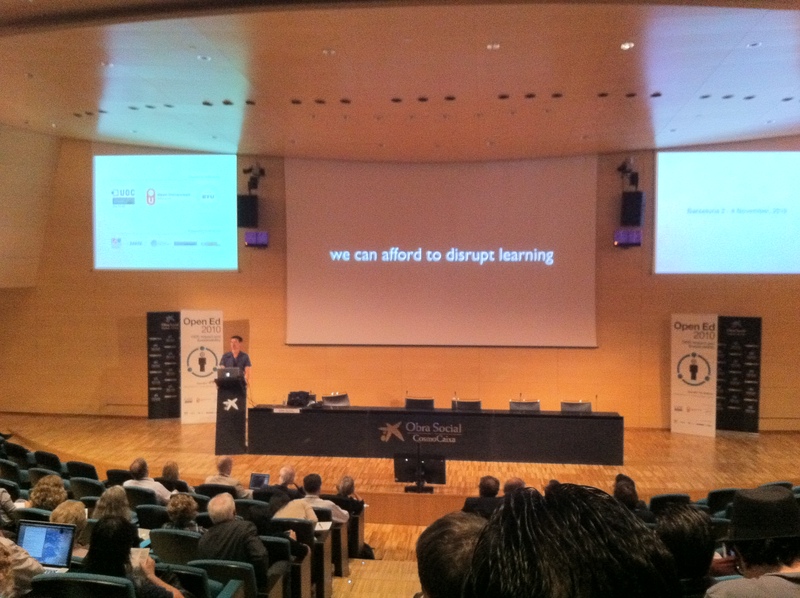 Erik Duval said a lot of things but there’s something fundamentally important about not being afraid to disrupt learning – oers probably have more quality assurance than the rest of course delivery. I can’t help but finish with the work of those I presented in the same session as: Julià Minguillón (UOC), Pieter Kleymeer and Molly Kleinman from University of Michigan- we all raised questions, limits and possibilities around the role of libraries in OER. It was great to find other people asking similar questions. Thank you to all of you who replied to the survey. The results were interesting and, although the initial analysis is done and the paper submitted, I’m aware that there’s a lot of analysis that I’ve not done – hopefully not, yet, done. The preprint of my paper for Open Ed is available in Strathclyde’s repository and (as an experiment) on Slideshare. Some expressions of interest in taking the work further – I’ll contact those who have expressed interest to figure out a way to take this forward that will allow us to coordinate our respective work in this area. What role do libraries have in the release or use of Open Educational Resources? 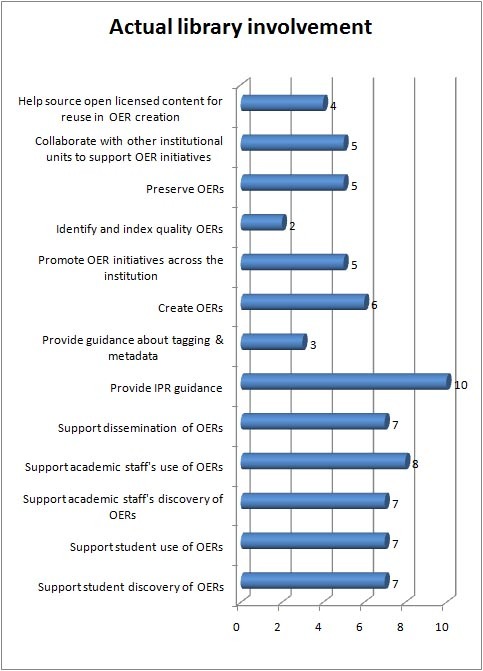 I’ve an ongoing interest in the role of Libraries in Open Education and have a paper for OpenEd 2010 looking at ways academic libraries might be involved in the release and use of OERs. I’m excited about the chance to present some of my ideas to that community and was pleased to discover that Open.Michigan have a paper on Libraries and the future of OER. We’re going to co-ordinate our papers to complement each other. There’s ten questions but most are quick responses. 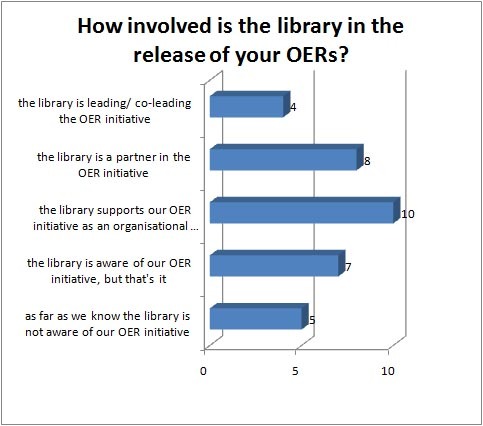 The survey is designed for OER projects and initiatives and there will be a follow up survey (at a later date) targeting the wider library community. I’ll blog the results as well as incorporating them into the paper. In my earlier post (Libraries, Institutions, and Open Educational Resources: possible connections?) 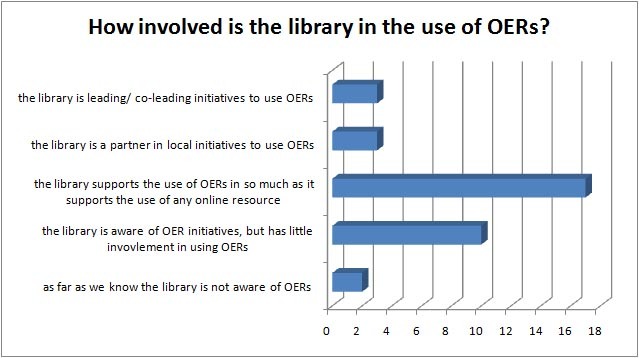 I mentioned one of the ways libraries might be involved in Open Education would be through extending some of what they already do in connection to information literacy to encompass supporting students in selecting and evaluating OERs. There is an assumption here that for teachers and learners there is a (not yet fully articulated) support skill which is a mixture of something from pedagogy/course design and something from information literacy. When we design courses or develop as self-regulated learners we select and use resources based not only on their subject and content but also on how they fit with or could be easily adapted to our environment, context, and learning style. I’m suggesting that there is a skillset here that’s part of the discovery and selection process which supports Open Education in the same way that information literacy supports research. Some of this is probably covered by traditional student support/ or course design courses through services offered by teaching and learning support services but I’m wondering if with OERs the scale of discovery, evaluation and selection begins to require a form of information literacy and be an area in which libraries collaborate with teaching and learning centres in supporting students. 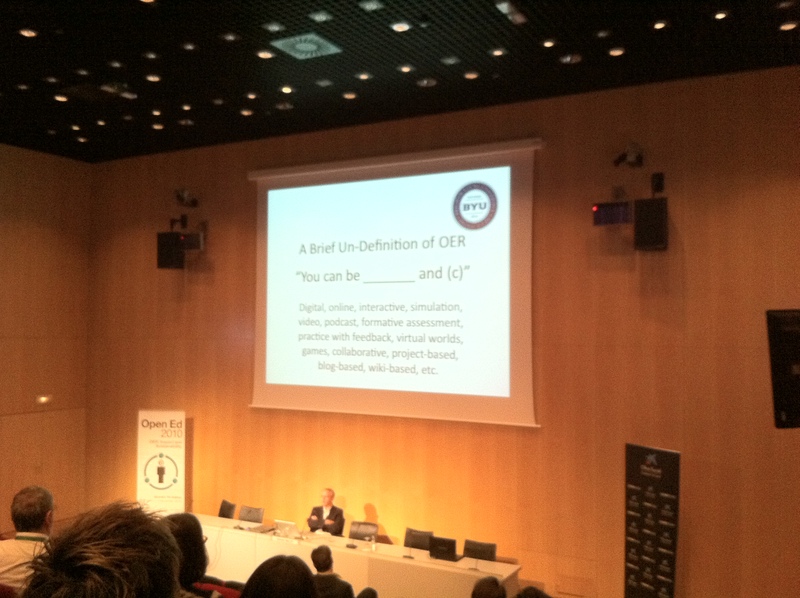 What do I think OER literacy looks like? well as a start I think it looks at some of these questions. Where does the resource come from? Does it have use appropriate sources? What cultural context does it assume? What legal jurisdiction does it assume? Is it specific to any given accreditation process? What can I do with resource? Is the resource format suitable for adaptation? Does it want access to particular digital resources (course readings)? Does it want access to particular tools/ infrastructure? Does it assume any form of online interaction/ community? Some of this information is the sort of question heavyweight elearning metadata standards tried to capture and to universally abstract into metadata. This isn’t the place to comment on those efforts but it is to say that there is a need to ask that type of question of a resource when we go to use it. And perhaps some of that process needs to be part of how users of OERs may need to be supported. Libraries, Institutions, and Open Educational Resources: possible connections? The growing success of the Open Access movement is transforming how institutions view, manage, publish, and access their research outputs – irrespective of any local commitment to Open Access. In a similar manner the Open Educational movement may transform how institutions create, manage, and share learning materials. Open Educational Resources (OERs) are a catalyst for institutional change. The growth of freely available learning materials from institutions around the world is, like Open Access, both an opportunity and a challenge for an institution. They offer the institution an opportunity to showcase their courses to potential students, enhance the reputation and visibility of the university among its peers and the general public, be seen to providing value for any public funding they receive by making knowledge more accessible, and promote a more flexible pattern of learning for enrolled students. They also, however, present challenges as the process of providing OERs is not straightforward and it accelerates the shift from understanding a university as a place where one goes to receive knowledge to understanding a university as a context for a community of learning in which students construct knowledge and a context for a student experience in which good facilities, pedagogy, and accreditation combine. If a student can access resources from many universities to support their learning, the quality of what a single institution adds to that content is crucial. Despite occasional protestations that self-archiving should be the norm, it is clear that academic libraries play a vital role in the Open Access movement and often provide skills, training, and advocacy, as well as managing the required infrastructure. Libraries are beginning to play a role in the emerging world of Open Data and Open Science, but their involvement in the OER movement has thus far been limited, as has their involvement more generally in the management of learning materials. Libraries may hold syllabi and past exam papers and may offer materials supporting information literacy and research skills, but they often play a lesser role in the management of lecture notes, presentations, or formative assessment materials. Such materials, are often held only by the lecturer, tutor, or department providing the course. Furthermore learning materials, where they are available, may be poorly integrated into the user’s view of library resources (See Tony Hirst, ouseful.info, the blog ‘Open Educational Resources and the Library Website’ August 10th 2009 http://tinyurl.com/yfkzq8g). There are plenty of legitimate historical reasons for this but as the range of digitally available materials increases, and in particular as the range of OERs increase libraries have an opportunity to capitalise on their already important role in the student’s studies, the academic’s professional development, and institution’s public portfolio. Librarians can help by contributing their own OERs to the commons; screening for, indexing, and archiving quality OERs; using OERs in their own teaching; and participating in discussions leading toward responsible intellectual property policies and useful standards. This summary highlights some of the key ways in which librarians can begin to be involved, but, I think, fails to consider how librarians can engage in the wider issues around the creation of OERs and their use. It interacts with Open Education in a way that parallels (to a degree) how librarians interact with Open Access. It does not yet consider the active role librarians can play in the initial description, management, and distribution of OERs. For example, In CETIS’s engagement with many of the institutional projects in Open Educational Resources programme I have noted that many are engaging with their university libraries, not only to seek advice about resource description and the application of metadata standards but also to consider the long term role institutional repositories might play in managing these assets and the possible role of the library in the OER production workflow. What institutional role could libraries play in the Open Educational movement? Although many academics in the OER movement have thus far had success making their learning materials available informally through tools like SlideShare, the process is more complex for an institution – especially if it is considering how it might maximise the return on its investment in openness (whether that return be in terms of publicity, goodwill, efficiency, or an improved student experience). It is also not without cost: for example, both MIT and Oxford have developed production workflows around a centralised unit which is responsible for branding and checking rights. The general failure of a Learning Object economy points to the need to develop less complex, more scalable and sustainable approaches to sharing OERs (Stephen Downes (2002) The Learning Object Economy http://www.slideshare.net/Downes/the-learning-object-economy). Such processes need to be informed by knowledge of resource description and metadata standards as they apply to the specific tools intended to disseminate the resources – whether that be a proprietary application (iTunesU), a generic search engine, a repository, or some combination of the above. As the ACRL panel also outlines OERs become additional resources that subject librarians can reference in supporting students; they are also, however, a new form of resource which students need appropriate information literacy skills to assess (skills such as assessing the quality of the material, its origin, currency, and fit with the student’s learning style) and they introduce (or will introduce) a new set of discovery tools for students and staff to be familiar with (such as Jorum, or aggregator services like OERCommons http://www.oercommons.org/ ). 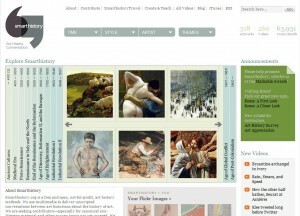 What opportunities and issues emerge for librarians and libraries from the OER movement? What role do libraries currently have in OER initiatives or the wider the management of materials relating to teaching and learning produced by institutions? Are library skills perceived as relevant to the management of teaching and learning materials (within libraries, within institutions, or by the OER movement)? What can the library offer the institution in this area? In the context of Open Educational Resources there are the beginnings of some consideration of how OER initiatives and libraries/ librarians might relate. There are some clear patterns but, in a somewhat similar way to the beginnings of the Open Access movement, there is a need to consider how OER initiatives scale and they integrate or relate to institutions (or not). I think libraries have an important part to play though one quite different than their role in the Open Access movement, but that’s a thought to come back to in detail another time (in a nutshell – I think OERs require a much more distributed and collaborative process). There have been some interesting offhand comments about the role of libraries cropping up in the context the UKOER programme and more widely the question surfaces every so often. The full presentation is over on slideshare http://www.slideshare.net/RJohnRobertson/oers-and-libraries and I’m hoping to get a chance to write this up a bit more soon.